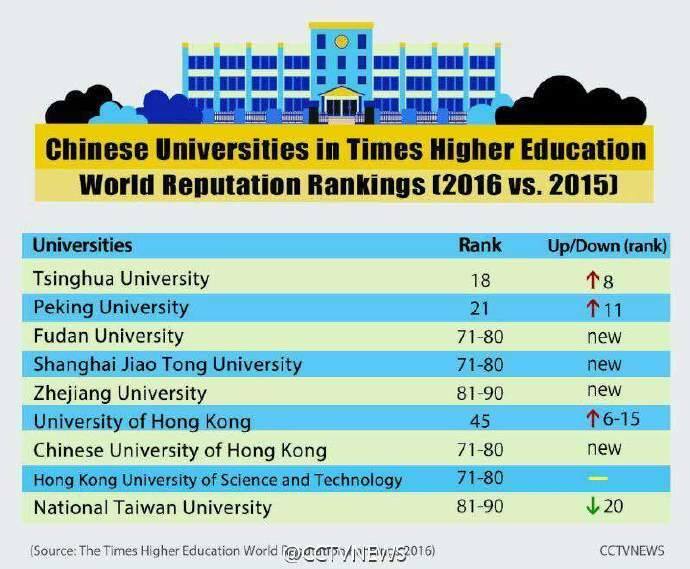 The Times Higher Education (THE) on May 4 published its World Reputation Rankings, with a record of nine Chinese universities making the top 100 universities' list for the first time. One Chinese university is listed in the top 20 world universities for the first time, with China's Tsinghua University at 18. Just behind is Peking University, at 21. It is the first time a Chinese university has broken into the world top 20. 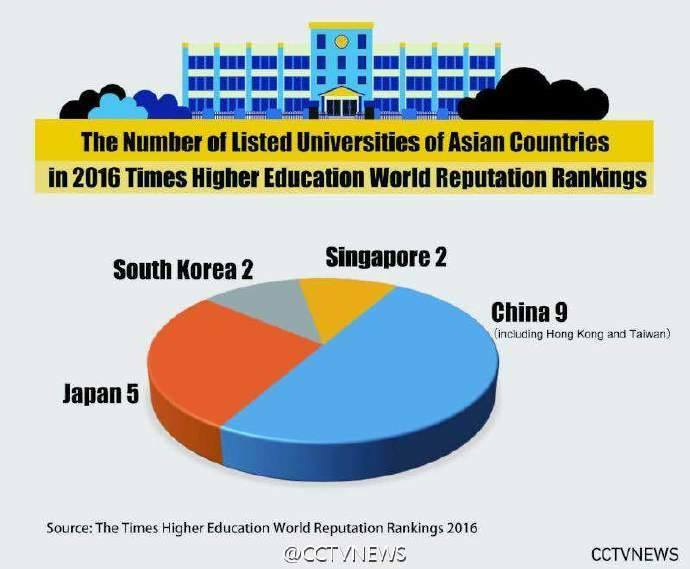 In addition, Fudan University, Shanghai Jiao Tong University and Zhejiang University are all listed in the top 100 for the first time. With the addition of three universities from Hong Kong -- the University of Hong Kong, the Chinese University of Hong Kong and the Hong Kong University of Science and Technology -- and the National Taiwan University, China has nine universities in the top 100. Phil Baty, editor of the THE World University Rankings says, "There is a really positive story for China. We have been watching China since the 1990s and the investment they have made in higher education and the reforms they have put in place to become more competitive on the world stage. The data published today really does show that China has arrived among the world's elite." The top of the listings shows little change from previous years, with Harvard at number one for the sixth year running, and with 43 institutions in the top 100, the United States still dominates the ranking. Britain is the next most represented country, with 10 universities making the rankings. Highest placed British universities are the University of Cambridge and the University of Oxford, ranked at fourth and fifth respectively. In total, there are 18 Asian universities in the top 100, and Paul Blackmore, professor of higher education at the Policy Institute at King's College London, said in a statement about the rankings: "We've had a highly Anglo-Saxon view of higher education for many years and that can't be sustained for much longer. Asia's rising performance is due to a combination of undoubted growth in university systems and of more being known among those giving a view." Baty says, "Asia has done well. We have seen a strong performance for Japan, South Korea. It is good news for the whole of east Asia but China is clearly outstanding with such a positive upward trend." Joshua Mok Ka-Ho, vice-president and chair professor of comparative policy at Hong Kong's Lingnan University, commented on the rankings, "That Asia's performance reflects heavy higher education investments from many governments in the continent and universities concentrating funding on strengthening their research capabilities and publishing in international journals."